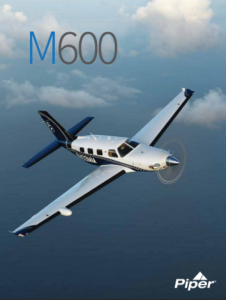 Piper has announced a special personalization package for the M600 called Expression or EXP, allowing customers to better customize their new aircraft. Customers can now choose from a number of enhancements ranging from custom appointed ceiling bezels to seat pattern styles and cockpit assist handles. Personalized customer logos and Piper logos are also options included in the new package. The M600 EXP also allows for more exterior customization with newly developed paint schemes and branding badges. In addition, Tumi luggage will be providing a custom baggage set designed to match the interior trim color of their aircraft. The M600 has also recently received approval from the FAA to include a Hartzell 5-blade propeller adding not only to the aircraft’s ramp appeal but boosting its performance and value. For more extensive information on the M600’s new options, read the press release here. Categories: Blog | Tags: 5 BLADE PROP, CUSTOMIZATION, EXP, EXPRESSION, M600, PERSONALIZATION, Piper, Piper aircraft, Skytech, and Skytech inc. This entry was posted on Friday, April 7th, 2017 at 1:38 pm. Both comments and pings are currently closed.